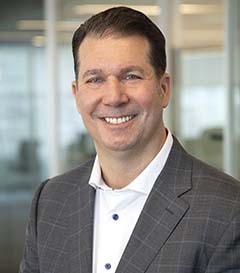 With extensive knowledge and experience in tax and legal software and services, Dean Sonderegger directs the Legal Markets Group of Wolters Kluwer Legal and Regulatory U.S. Under his leadership, the team provides technology and information solutions to law firms, corporate legal departments, law schools, government and other organizations. In this role he is responsible for accelerating the vision and strategy for the Legal Markets and Innovation teams, with a particular focus on rapid development of advanced digital products and services to enhance customers’ efficiencies and workflow. Mr. Sonderegger is a highly sought-after speaker and thought leader in the areas of artificial intelligence, blockchain, the evolution of the legal profession, and leading business transformation. He currently authors a column for Above the Law on the intersection of technology and the practice of law, and his commentary has appeared in several publications including Forbes, CFO Magazine and ABA Journal. Mr. Sonderegger has more than 25 years of experience in the tax and legal software and services industries. He received his M.B.A. from George Washington University and holds both a B.S. and M.S. in Electrical Engineering from Columbia University.